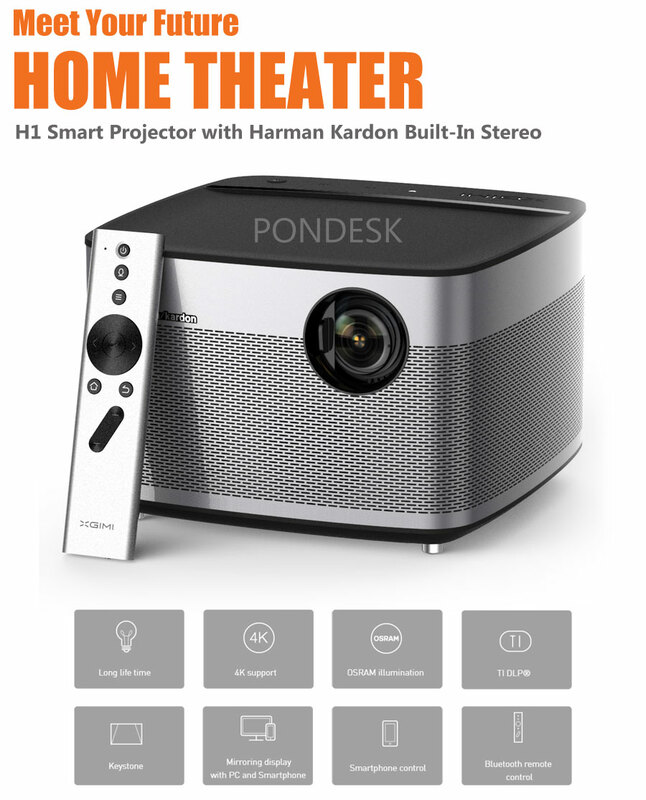 XGIMI H1 4K 300'' 3D Projector all-in-one smart home theater system, with Android OS, massive HD display up to 300”, brightness rated at 900 ANSI lumens for effortless daytime or bright-light viewing & Harman Kardon 45mm built in Bluetooth Hi-Fi stereo sound. H1 is the amazing smart projector that replaces any home theater with an elegant single-cable box. 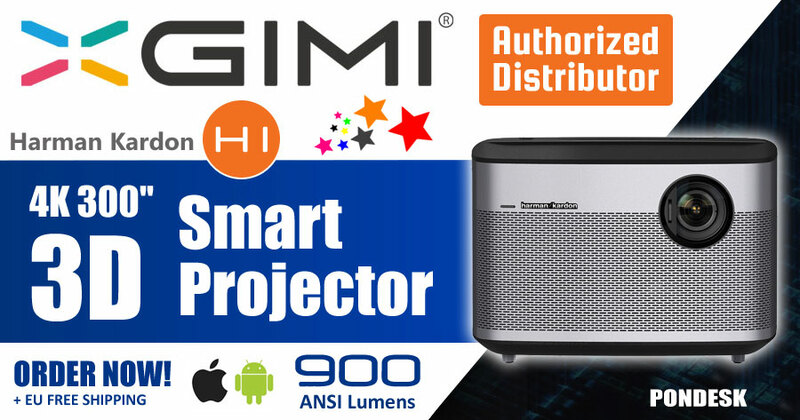 The XGIMI H1 is our new & improved Smart LED projector that can truly display the clarity and precision of TRUE HD 1920 x 1080p, rivaling far more expensive projectors transforming any surface into a 300-inch screen with unparalleled brightness and clarity. Experience superior Hi-Fi sound quality with the 45mm built-in Harman Kardon stereo sound that can also be used as a stand-alone Bluetooth speaker. Bring standard 2D video to life in brilliant 3D. 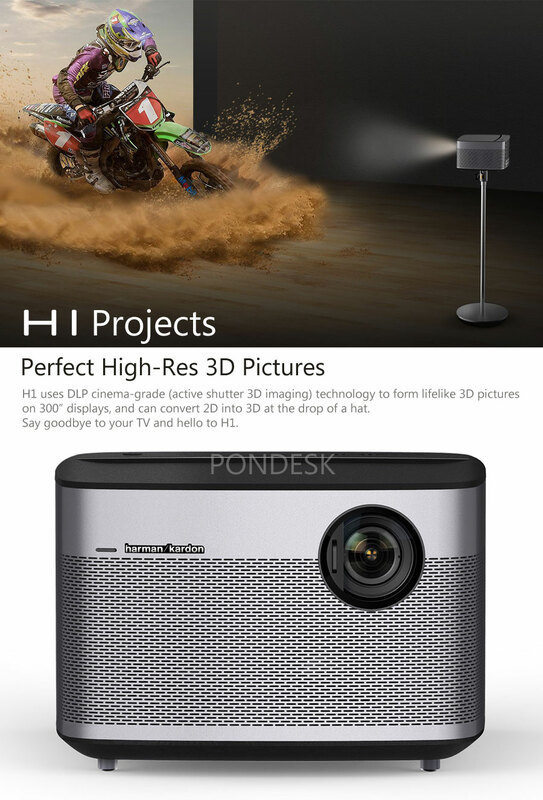 Install apps and games with H1’s Android OS and stream directly to the projector for a truly connected, superior viewing experience. Connect with your smartphone or console to enjoy immersive game-play. Control your entire home theater system with H1’s wireless, Bluetooth enabled remote. 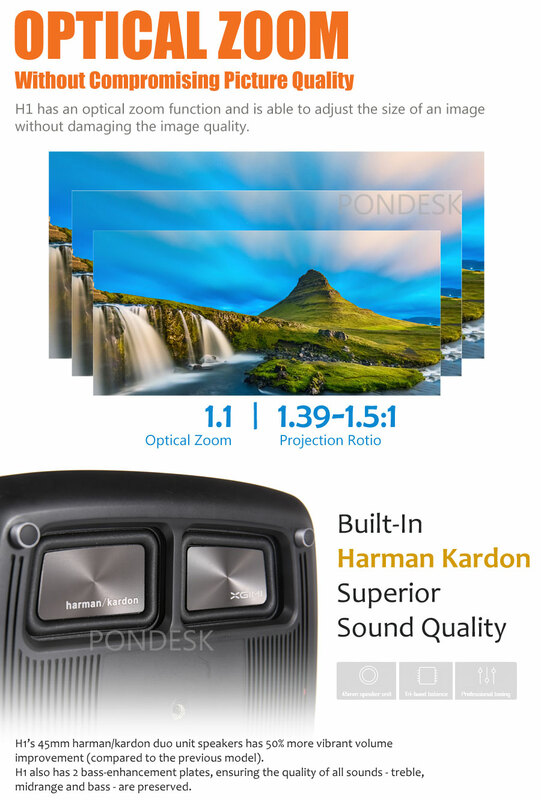 H1’s native resolution is HD 1080P, 2.25x clearer than standard 720P projectors. H1 uses DLP active shutter 3D imaging (cinema-grade technology) to convert any 2D video into a 3D feature film on a 300” display. H1 has top of the line Harman Kardon bass-enhancement which ensures Hi-Fi quality for all sound ranges. Plus, H1 is a Bluetooth speaker. H1 boasts the brand new Mstar 6A928 TV chip, Cortex A17 structure, Quad-core 1.75GHz CPU, HEVC/H.265 form 60fps ultra HD 4K decoder and 3GB RAM. H1’s sophisticated hardware delivers on all of your video, app, and gaming needs. You never need to replace the bulb. Keep H1 on 8 hours a day for up to 10 years. Q: Can XGIMI H1 connect with Blu-ray DVD players? A: Yes. You can connect blue-ray & DVD player with the H1 projector by following the below steps. Step 1: Connect the DVD player with the projector through a HDMI cable. Step 2: Go to the Z4 Aurora's interface, and press the <left key> of the <direction key> on your remote control then select signal source to HDMI. Q: Can a normal camera tripod be used to support this projector? A: Yes, you just require H1 Holder to mount the projector on the camera tripod. A: XGIMI warrants H1 against defects in materials and workmanship under normal use for a period on ONE (1) YEAR from the date the purchase. If the H1 projector is defective, XGIMI will cover shipping fee to repair the defective device for free in 15 business days. 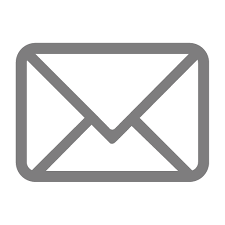 This Warranty does not cover and shall be void for defects or damages resulting from casualty, accident, transportation, misuse or abuse, liquid, viruses and spyware, neglect, alterations, and service or repair by other than XGIMI.